The literal meaning of Peshwa is Prime Minister. The Peshwa rule in India started after the Marathas. These Peshwas were initially Prime Ministers to the Maratha rulers and commanded the armies. Their rule started in the year 1749 AD until 1818. The original purpose of the Peshwas was to monitor the administration and military of the Maratha Empire. They were also responsible for managing foreign affairs with other states. After the golden period of the Maratha kingdom which was during the reign of Shivaji Maharaj none of the other Maratha rulers were competent enough to keep their empire consolidated and under control. Therefore after his reign the Maratha power was basically controlled by the Peshwas. The word Peshwa was first introduced in the Deccan region by the Muslim rulers. The very first Peshwa was Moropant Trimbak Pingle who was appointed by Chhatrapati Shivaji during his reign. The word Peshwa is derived from the Persian language which means ‘foremost’. According to historical findings, Peshwa Sonopant Dabir was appointed to assist Shivaji by Shaji and given the power of a Prime Minister. Ramachandra Neelkanth was one of the best administrators and foreign negotiators that the Maratha Kingdom has ever had. He was also known as Ram Chandrapant Amarthya Bavadekar. He was appointed in the service of Chhatrapati Shivaji and was the youngest member of his Council. He also served Chhatrapati Sambhaji, Sambhaji II and Raja Ram. During the period of 1618 to 1699 he received the title of a king from Chhatrapati Rajaram as ‘Hukumatpanha’. He was also the author of the famous code of civil and military administration known as ‘Ananya Patra’. Ramchandra was also a great Warrior and helped the Maratha rulers recapture several forts from the Mughal Empire during the period of 1690 to 1694. He was skilled in Guerrilla warfare techniques and received the support of Great Maratha Warriors like Santaji Ghorpade and Dhanaji Jadhav. He even took part in wars during the years 1690 to 1694. Ramchandra Neelkanth acted as a shadow king of the Maratha Empire in the absence of Chhatrapati Rajaram. 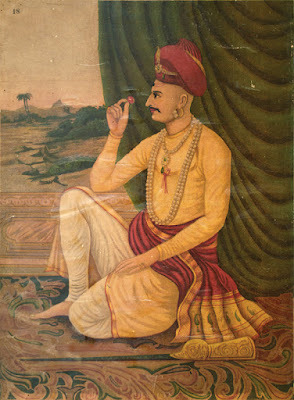 Tarabai was appointed after Ramchandra Neelkanth Bahutkar as the Maratha Peshwa. In the Konkan region the Bhat family of Shrivardhan was appointed as the Peshwas. When Chhatrapati Shahu was the Maratha ruler he appointed Balaji Vishwanath Bhat as Peshwa in 1713 A.D.
Balaji Vishwanath Bhat was a chitpavan Brahmin and he was the first Peshwa who made the office of Peshwa, hereditary. He was very cunning as far as diplomacy was concerned and also a great military general. Under his leadership, he raise the Marathas from a micro minority to great power. He was succeeded by his son Baji Rao who was also a great military leader and a diplomat just like his father. He freed several Maratha provinces which were under the power of Mughal Supremacy and also expanded the Maratha dominance in the Deccan region. Baji Rao I expanded the Maratha territory by including the areas of Gujarat, Malwa and parts of Bundelkhand into the empire. The last Peshwa was Bajirao II who was defeated by the British East India Company in the third Anglo Maratha war which was fought in 1817-1818, in the battle of Khadki. The East India Company conquered the parts of the Peshwa territories in Central Maharashtra and included them in the Bombay province. When Chhatrapati Shahu made Baji Rao I as the Peshwa in the year 1793, he informally made the position of Peshwas hereditary. This event was not received very well by the general Trimbak Rao Dabhade who was the commander in chief of the Maratha Army. Trimbak was later killed in the battle of Bijapur on April 1st 1731 after which the Bhat family was given absolute control over the Maratha Empire. Baji Rao’s son was appointed as Peshwa by Chhatrapati Shahu in the year 1740. As the Peshwas were already imparted with significant authority to lead the Maratha army, Shahu made them his successors before his demise in the year 1749. When the Maratha Kingdom came under the Peshwas, they called the direct descendants of Chhatrapati Shivaji as ‘swami’ which means ‘the real owner’ in Marathi. After the death of Madhav Rao in the battle of Panipat, the Peshwas were left as only ceremonial head of state. Albeit many state and private BUSINESS MUT foundations are putting forth separate learning programs, not these projects are authorize.